Now y’all know me, I love a good panini! In fact, back in the States, the hubby and I usually made paninis a couple times a week! Sadly though, we had to leave the panini press behind and, well, I just don’t the storage for one here. But I bought an oven, so I thought my problems were solved, until I couldn’t find deli meat- well they have “deli meat,” but not really deli meat! It all looks just like spam to me, sometimes just sliced thinly! But, as you know, I found chicken at the grocery down the street, and I can buy a garlic baguette down the street at Paris Baguette! So I had the essentials for a panini! Now it was just a matter of what to put on it. After much deliberation I decded to make 2 kinds. For the first one I kept it simple, just grilled leftover chicken and mozzarella cheese, but the second one I got more adventurous…this one was for me because I’m more adventurous than the hubby- anywhere we go you can always here him say the phrase, “chicken and cheese only, please” Mexican, sandwiches, you name he’s a meat and cheese kinda guy…but me, I’m different, I love the blending of tastes! For my panini I went with a more bruschetta inspired sandwich. 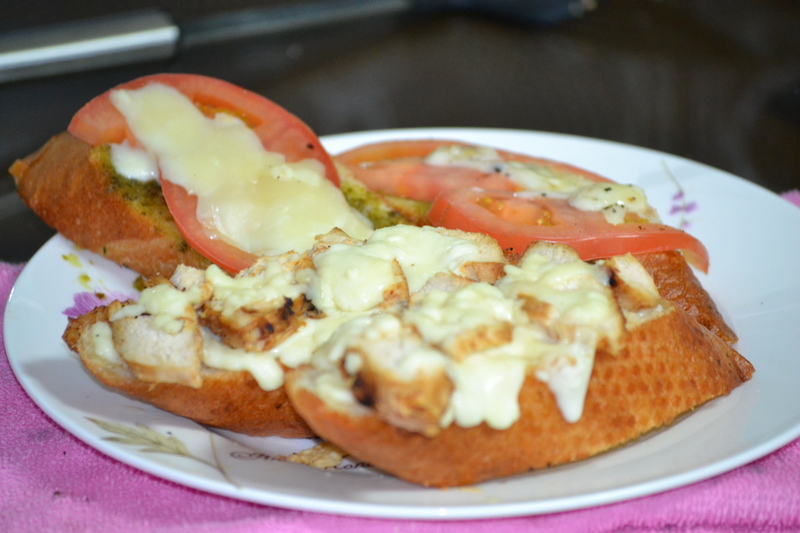 I topped my bread with pesto, which I brought from home, tomatoes, and mozzarella cheese, of course! It was heavenly! I can’t wait to try it again!